Gauḍapāda (Sanskrit गौडपाद) c.6th century CE), also referred as Gauḍapādācārya, was an early medieval era Hindu philosopher and scholar of the Vedanta school of Hindu philosophy. While details of his biography are uncertain, his ideas inspired others such as Adi Shankara who called him a Paramaguru (highest teacher). The century in which Gaudapada lived and his life details are uncertain. Estimates vary from early 6th to 7th century CE. He is generally dated from estimates for Adi Shankara, whose teacher Govinda Bhagavatpada is presumed to be the direct disciple of Gaudapada. Shankara in some texts, refers to Gaudapada as the "teacher's teacher" who knows the tradition of the Vedānta (sampradāya-vit). Assuming how long each lived and when, Gaudapada is estimated to have lived sometime in the 7th century CE. Alternatively, states Potter, the phrase "teacher's teacher" should not be taken literally, and more in the sense of another phrase he uses for Gaudapada, namely Paramaguru (highest teacher). He may have been the guru of Sankara's teacher, but was likely a more distant guru, states Michael Comans (aka Vasudevacharya). The Māṇḍukya Kārikā is a concise explanation, in verse form,[note 2] of the doctrines in Mandukya Upanishad, one of the shortest but a profound Upanishad, consisting of just 12 sentences. Even before the time of Adi Shankara, Mandukya Upanishad was considered to be a Śruti, but not one particularly important during his era. In later periods it acquired a higher value, and expressing the Upanishadic essence. The Karika, notably, presents rational arguments from dream states, infinitude and finitude, space and time, causality, disintegration, and generation in support of the advaita doctrine. ^ Nakamura notes that there are contradictions in doctrine between the four chapters. ^ Karika is defined by Monier-Williams as "concise statement in verse of (esp. philosophy and grammar) doctrines" in the Indian traditions. 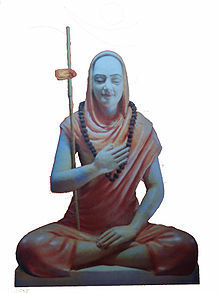 ^ Adi Shankara interprets this Karika somewhat differently, according to Comans. ^ It is often used interchangeably with the term citta-mātra, but they have different meanings. The standard translation of both terms is "consciousness-only" or "mind-only." Several modern researchers object this translation, and the accompanying label of "absolute idealism" or "idealistic monism". A better translation for vijñapti-mātra is representation-only. ^ 1. Something is. 2. It is not. 3. It both is and is not. 4. It neither is nor is not. [page needed] The 'four-cornered negation' is an English gloss of the Sanskrit, Chatushkoti. ^ The influence of Mahayana Buddhism on other religions and philosophies was not limited to Vedanta. Kalupahana notes that the Visuddhimagga – a Theravada Buddhist tradition, contains "some metaphysical speculations, such as those of the Sarvastivadins, the Sautrantikas, and even the Yogacarins". ^ a b c d Raju 1971, p. 177. ^ a b c d e f Potter 1981, p. 103. ^ a b c d e f Potter 1981, p. 105. ^ a b Sarma 2007, pp. 125-126. ^ a b c Nakamura 2004, p. 308. ^ Potter 1981, pp. 106-111. ^ a b Nakamura 2004, p. 311. ^ Michael Comans 2000, p. 163. ^ Nakamura 2004, p. 3. ^ Michael Comans 2000, p. 2, 163. ^ Michael Comans 2000, pp. 45-46. ^ a b Sarma 2007, p. 126. ^ a b c d Nakamura 2004, p. 280. ^ See Introduction of Mandukya Upanishad with the Karika of Gaudapada and the Commentary of Shankaracharya (trans.Swami Gambhirananda. Calcutta: Advaita Ashrama, 1995) and Domenic Marbaniang, "The Advaitin Search for Unity in Diversity", Epistemics of Divine Reality: An Argument for Rational Fideism, PhD Dissertation (Bangalore: ACTS Academy of Higher Education, 2007). ^ a b Nakamura 2004, p. 211. ^ a b c d e f g h Potter 1981, p. 106. ^ a b c d e f Potter 1981, p. 107. ^ a b c d e f g Potter 1981, p. 108. ^ a b c d e Potter 1981, p. 110. ^ a b Nakamura 2004, p. 309. ^ Nakamura 2004, p. 310. ^ a b Arvind Sharma (2012). Sleep as a State of Consciousness in Advaita Vedanta. State University of New York Press. pp. 41–48. ISBN 978-0-7914-8430-2. ^ Arvind Sharma (2012). Sleep as a State of Consciousness in Advaita Vedanta. State University of New York Press. pp. 43–45. ISBN 978-0-7914-8430-2. ^ PT Raju (1985), Structural Depths of Indian Thought, State University New York Press, ISBN 978-0887061394, pages 32-33; Quote: "We can see that this story [in Chandogya Upanishad] is an anticipation of the Mandukya doctrine, (...)"
^ Isaeva 1995, p. 30-34. ^ a b Isaeva 1995, p. 43. ^ Isaeva 1995, pp. 44-45. ^ a b Potter 1981, pp. 108-109. ^ a b c Potter 1981, p. 109. ^ Michael Comans 2000, p. 166. ^ a b c d Potter 1981, p. 111. ^ a b Potter 1981, p. 112. ^ Potter 1981, pp. 112-113. ^ a b c d e Potter 1981, p. 113. ^ Potter 1981, p. 114. ^ a b Michael Comans 2000, p. 2. ^ Kochumuttom 1999, p. 5. ^ Sarma 2007, pp. 126, 143-144. ^ Garfield & Priest 2003. ^ Raju 1971, p. 177-178. ^ Sarma 2007, pp. 145-147. ^ a b c Potter 1981, p. 104. ^ Shri Gowdapadacharya & Shri Kavale Math (A Commemoration volume). p. 10. ^ http://www.shrikavalemath.org.in/, Title: About Kavale matha.